A line chart displays successive stock prices connected by a line over time. For example, this type of chart shows hourly changes to the Dow Jones Industrial Average (DJIA) in a day of trading and the closing prices of a stock or the market over time. Figure 11–1 shows an example of a line chart with the closing monthly prices of Amgen, Inc., for the months April 2005 through September 2006. It shows the historical price patterns for the company and, according to technical analysts, shows trading opportunities in the stock. As more data are plotted, more of a pattern emerges, which technical analysts study. From a chart, they can determine such trends as the upward trend shown in Figure 11–2. Obviously, there is an art as to the drawing of trend lines because no precise body of data indicates how to draw them. The trend line is drawn from the lowest points to the highest points. 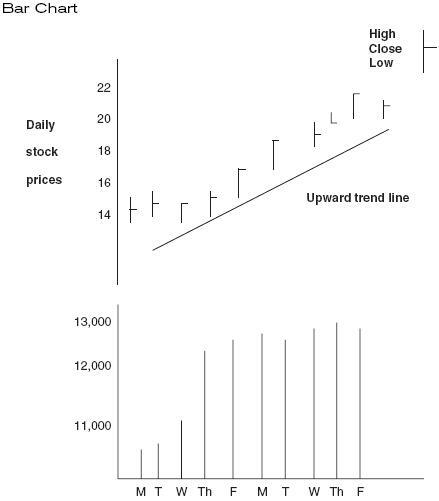 After a trend for a stock is established, an analyst follows the stock price to look for any changes in the trend. When the stock price falls below the upward trend line, technical analysts recommend selling the stock because the trend has been broken. Similarly, the crossing of a downward trend indicates a buy signal for that particular stock. Trend lines form the basis for buy and sell signals.